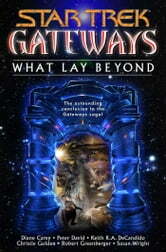 Created by the incalculably ancient Iconians, whose transcendent technology is quantum levels beyond that of the Federation and its allies, the Gateways offer instantaneous transport across unimaginable distances. Throughout the known galaxy, from Deep Space Nine™ to the New Frontier, from the Delta Quadrant to the bridge of the Starship Enterprise™, the sudden reactivation of the Gateways has destabilized interstellar relations between planets and cultures previously separated by countless light-years. Starfleet's finest have coped with the crisis as best they can, but circumstances have forced several valiant commanders to leap through separate Gateways into the unknown. All of these heroes, for their own reasons, have taken the ultimate gamble: hurling themselves personally through a Gateway without any knowledge or forewarning of what lay beyond. Each must face their own unique challenge, struggling to find a way back to the ships and homes they left behind. And waiting behind at least one of the Gateways are the ageless Iconians themselves, the primordial architects of the mysterious portals causing chaos throughout the Milky Way galaxy. 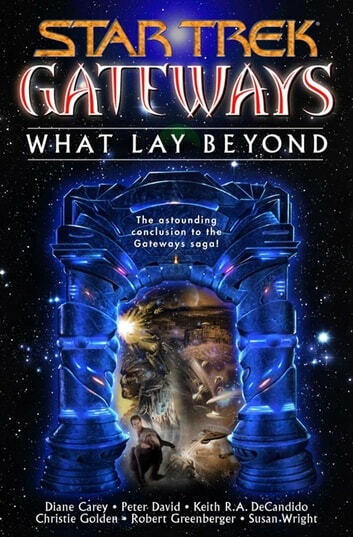 What Lay Beyond brings the Gateways saga to a spectacular finish, in an all-star collaboration by six popular, bestselling Star Trek authors. Among them, Diane Carey, Peter David, Keith R.A. Decandido, Christie Golden, Robert Greenberger, and Susan Wright have written dozens of Star Trek novels. This is their first mega-collaboration.